Have an Odd Sized Filter? No Problem. Have you ever gone to the store to purchase an air filter, and after searching for a while, you found one you thought would fit? But when you get it home and try to install it, you find out it doesn't fit very well? Well those days are over! HealthSmart Filters are hand crafted to your exact size - not some generic, one-size-fits all.Your HealthSmart Filter is custom made to fit perfectly, so it can filter your air perfectly. Designed & manufactured in the USA! Patented Leak-Guard SealTM Gives You 100% Air Protection. To make sure that all the air and pollutants go through your furnace filter and not around it, your new filter features our patented Leak-Guard Seal. When your air conditioner or furnace turns on, the difference in pressure causes an air tight seal. No bypass means your filtering 100% of the air. That means the harmful particles are trapped in the air filter, rather than in the lungs of you and your family. Our Filters Are Not Made of Cardboard. 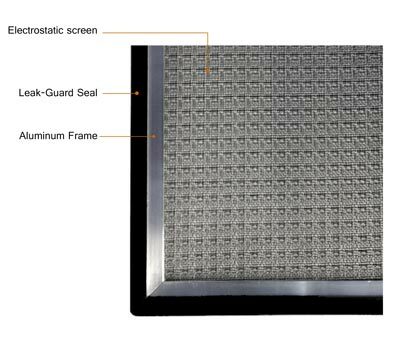 HealthSmart Filters are crafted from industrial strength aluminum alloy, not cardboard! Your permanent reusable frame is built to last. It's backed by a 10 year warranty! 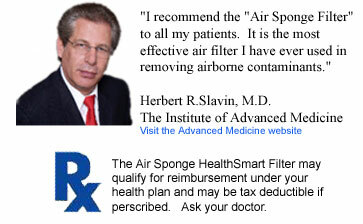 You'll receive the patented HealthSmart, custom made air filter frame. This permanent, 100% aluminum frame features a unique Leak-Guard Seal, to eliminate bypass. And to enhance performance, a permanently attached, electrostatic screen. We'll make your new frame to any size that you need. That means you will always have a filter that fits perfectly! 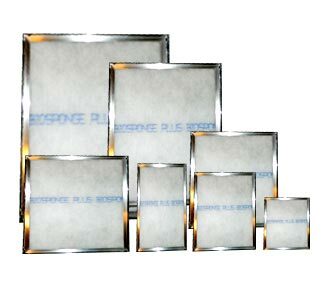 You choose what type of replaceable air filter media goes inside your frame. Replaceable air filter media assures a new, clean air filter every time. No more guessing if your filter is really clean & healthy. Select the media that suits your needs best, you can always switch to a different type any time you wish. The combination of it's perfectly sealed aluminum frame, and our advanced air filtration inserts, puts this air cleaning system... in a class by itself. Could not live or breathe without these filters. Very seldom use my inhaler at home because of them. You can see the results when you change the filter so you know it is doing what they say it will do. Have tried HEPA filters, charcoal filters, and certain other filters that gave me asthma attacks from the materials they were made from. These are absolutely perfect. Saves You Money & Time. When you have a clean heating/cooling system, you have lower electric bills, less repair bills and longer lasting equipment. Forget about spending your weekend at the mega stores searching for air conditioner filters! 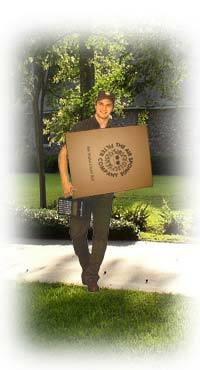 We'll ship your replacement custom filters right to your door, and shipping is FREE! Improves Your Air Quality - Guaranteed. You'll feel better knowing the air you're breathing is healthier. HealthSmart Custom Air Filters are up to 60 times more effective in capturing dangerous fine particles and fumes from your air, compared to ordinary store bought AC filters! Your new custom air filter arrives ready to install, nothing to assemble. Completely backed by the Air Sponge 60 Day Money-Back Guarantee. 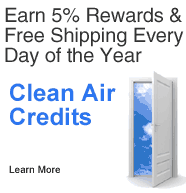 Clean, fresh air and so convenient -- you owe it to yourself to give it a try. Choose the Filter Media that Fits Your Needs. All systems include our patented custom made HealthSmart filter frame.